It’s time to get that beach body tight again. That means losing all that holiday weight, manicures, pedicures, and most importantly taking good care of your skin. If you’re obsessed with your skin as much as we are, then you know that all those winter months can really be good for your skin. The sun may be warm and nice but it can also burn you. Here are a few tips that will help you enjoy the summer without causing harm to your skin. This is fairly obvious. As tedious as slapping what seems to be an entire tube of sunscreen on your body might be, the alternative is much, much worse. Summer time translates to sunshine all day, every day for months. And sometimes the temperature reaches up to the high 70s, 80s, or even higher… and those kinds of temperatures can be really dangerous for your skin. The heat can cause inflammation and peeling. Sure, cooling gels can reduce the redness and swelling but the damage is already done. Your skin will most likely be damaged and you might get blisters if you aren’t careful. So, never forget to wear sunscreen when going outdoors. You never know when you’ll get stuck in the sun for an extended period of time. You’re probably asking yourself “what does water have to do with my skin?” Well, the summer is a real hot time of the year and because of this we need to place extra effort on hydration. 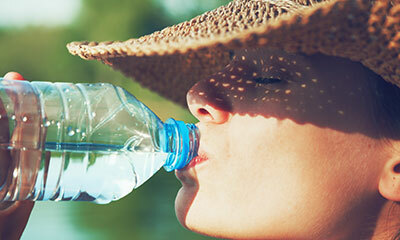 The higher temperatures and the more time we spend outdoors are bound to leave us dehydrated. We might sweat and laugh but our bodies are losing fluids a lot quicker now that it’s the summer time and as a result this dehydration will spread across the body and appear in obvious places like the skin and eyes. That is why we need to drink a at least a two liters of water every day if we can. Our skin is the first thing people see and we want you to feel confident in your body! To cut the story short, we need water to make sure we look healthy and well-taken care of. This is a no brainer too. It might be a million degrees and it might be summer but your skin still needs treatments and pampering like the rest of you so that’s why you should moisturize, exfoliate, and give yourself a facial every chance you get. Heavens knows that your skin never needs it more than during the summer months. Use facial masques that moisturize your skin. Use toners and other moisturizers to get that amazing skin of yours glowing again, it’s never a bad idea to moisturize. When you exfoliate you get rid of dead skin that clogs up the pathways your pores need for proper hydration. Taking hot showers during the summer time can be very bad for your skin. Regardless of whether or not you go sunbathing, your skin gets damaged from walking or generally just being in the sun. After all that exposure it’s always better if we cool off with something cooler, we can reduce the damage that these injuries can cause in the long run. Plus, a cold shower has some other benefits like preventing acne, other skin-related diseases, and making our skin clearer. When the sun comes back, so do the bugs. It’s incredibly difficult to find insects in cold places, they always return when the summer comes back and they come in the dozens. So, there is a big chance that you might get bitten by a bug this summer and that is ok. You can get bug spray and reduce the possibility, but if you still get stung or bitten – don’t scratch. Historically, scratching hasn’t always been the smartest thing to do, it just makes everything worse. Suddenly the bite is the size of a small golf ball and you can’t stop scratching. When you get stung, go to your local drug store and pick up some anti-itch cream for relief. Scratching will only damage your skin and if you have very fragile skin, it could turn into a bruise or something. So, don’t do it it’s not worth it. It can be very tricky to look like the best version of yourself with all these emerging threats. Luckily these tips will put you through and ensure you are the best you all summer.